Each bottle opener is thoughtfully designed and created from scratch by husband and wife, Brandon and Erin, in their rural north Georgia barn studio. 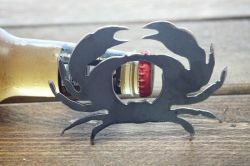 The bottle openers are made out of 14 gauge hot-rolled industrial A-36 steel. Which is covered with a thin layer of black oxide (magnetite) which is responsible for its dark gray/bluish tint. While this provides a level of protection against corrosion, a beautiful patina can appear on the surface of the metal and be enhanced by a minimal amounts of exposure to humidity. If any rust is unwelcome you may want to keep your piece inside a climate controlled environment. Steel Care: Rub grade 3 coarse steel wool over the top to remove any and/or all unwanted rust. To remove finger prints or to prep for paint wipe the steel down with acetone which will clean the surface.